Alphamine delivers ingredients acting both independently and synergistically in a formula that takes physique transformation to the next level, no - this is beyond the next level. This is an entirely new playing field. This powerful thermo powder is designed to give a quick custom serving for every user. As a powdered thermo, each and every user can fully customize their serving size and frequency however they choose. No more being stuck with only 1 or 2 capsules. enjoy fully customizable servings anytime, anywhere. Find your sweet spot. 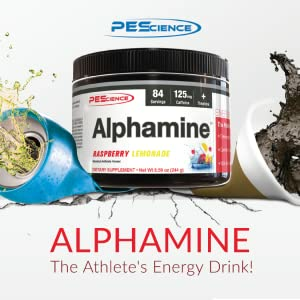 Alphamine mixes quick and easy with a spoon and tastes like something you'd only drink on your cheat days, no medicine mouth here. Two small scoops with 8-10 ounce of water and you can be on your way. Athletes know better than to chug a sugary energy drink, or fat-loaded latte. That's why they reach for Alphamine, the energy powder designed for athletes and fitness enthusiasts. The combination of caffeine and theanine gives users a nice smooth, alert energy that lasts for hours with no crash. With 84 Servings per container, Alphamine is loaded in value AND effectiveness!